October is going to be an exciting month. This weekend I’ll be making my eighth (?) consecutive appearance at the New York Comic Con (this Thursday through Sunday) in my usual spot these past three or four years: booth 1259 in Small Press. Plus, I’ll have a special guest with me at the show. But even before that, if you follow me on social media (and if not, follow me now), you’ll know that I’ve decided to participate in Inktober this year (that is, wherein artists post an inked drawing a day through the month of October). The plan is, providing I have the time, energy and like the sketches enough, to print up a collection of the sketches after this month. 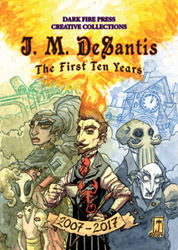 This is not a replacement for the forthcoming sketchbook (which is the next release following the second Gentleman Cthulhu collection), though I may decide to make it an exclusive for my followers on Patreon (patreon.com/jmdesantis). I haven’t decided on these last details yet. As for New York Comic Con, it’s going to be (I hope) a monumentous event. 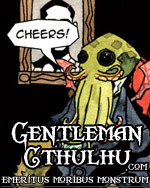 Gentleman Cthulhu: Twice the Fears and Cheers may make it into my hands before the end of the show (all fault to me and not my wonderful printer, Ka-Blam: ka-blam.com). If not, I’m certain I’ll be busy with convention sketches and conversations throughout the weekend. Plus, as an added bonus, I’ll be sharing my booth space this year with the immense artistic talent of Chris Campana! I met Chris last year at Baltimore Comic-Con, and he’s sort of mentored me on a few things in the past year (including my forthcoming sketchbook). I’m looking forward to sharing the space and a bit of the spotlight (he’s certainly a better known name then me). That said, for anyone who follows me avidly, it may seem participating in Inktober is a poor choice this year considering how far behind I am on other projects. Again I would argue that I produce at least one warm up sketch in pen every day. More, I have plans for the coming months and year (and perhaps even further, providing I have some success with the current plans), and keeping up with my timeline whilst catching up on my other projects is essential. Amongst other things (and I’ve written about this before), the break I took back in the summer months helped me to clear my head about my work (which was becoming unmanageable) and I decided upon a new plan of action. After all, I have a number of projects I wish to work on, and even if Chadhiyana and Gentleman Cthulhu were my only projects, the way I was handling the production of both was simply not working, and leading to a lot of unnecessary stress and delays. As I’ve also said before, it’s going to take time to climb out of the hole of back-work whilst putting my new plan into practice—which incidentally will ensure a happier life for me and (once I have caught up) a smoother production and release of all of my work going forward (that includes Chadhiyana and Gentleman Cthulhu). As I keep saying, be patient. Also, if you want a little more information, you can always join my Patreon for even a dollar a month. At that level you at least get, if nothing else, access to my Patreon feed which typically includes more information than I post publicly on my blog: patreon.com/jmdesantis. With that, I hope to see a lot of you come by my booth at NYCC this weekend, even if it’s just to say hello. Again, Small Press booth 1259. Otherwise, I’ll be back more next week with more, or you can follow me on social media to see what I come up with this Inktober!